Today, I have stumbled across an article about the exemption of Rey in the latest The Force Awakens merchandise, and it is true, I have hardly seen any Rey products! 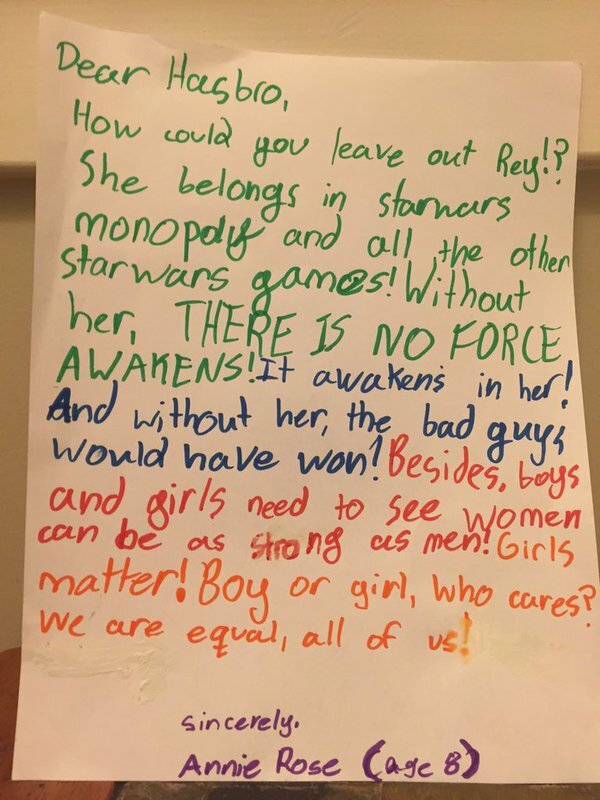 She has a point, and hundreds of thousands around the world are feeling the same too – #WheresRey is now trending all over Twitter and Facebook at the moment and some celebrities have picked up on this article too! Rey is one of the main characters, and no matter what gender in the first place, surely you would put your main character, the one that pretty much saves the day into your product?! Without her, things could’ve ended badly in the movie! (No spoilers). Moving onto a different point of merchandise target audiences, I feel like there definitely should be more girl-focused Star Wars merchandise released in general anyway, they could play with so many ideas and run with them! Mix it up a bit, even if it’s still a girly product but is revolved around the Star Wars franchise or some of the female characters – go for it! Come on, who doesn’t want a Rey costume by the way?! For example, I was brought up with Star Wars from a very, very young age as my brother and father were really into it. But again, I ended up playing with my brothers toys and the only ones were mainly focused towards boys. I had no problem with this at all, I was happy enough playing with my own Millennium Falcon and Rancors, although I saw the cutesy feminine side to Ewok Adventures. They could’ve played with that concept a lot more, merchandise wise and I think that they definitely have so much potential from The Force Awakens! What do you lot think? They need more female related merchandise? Feature Rey a lot more, as she is.. the hero? Duh! Not saying that this is just a female thing, but I’m pretty sure that the guys would want Rey in their collections too, as she was such a strong characters and a huge piece to the film! I found this completely bazaar that Rey had been left out of merchandise for the film, I know they tried to justify it by stating they didnt want to give the story line away, but still… she is the bloody main character for christs sake!! Exactly! It’s not even about genders! She is the main character hahaha!